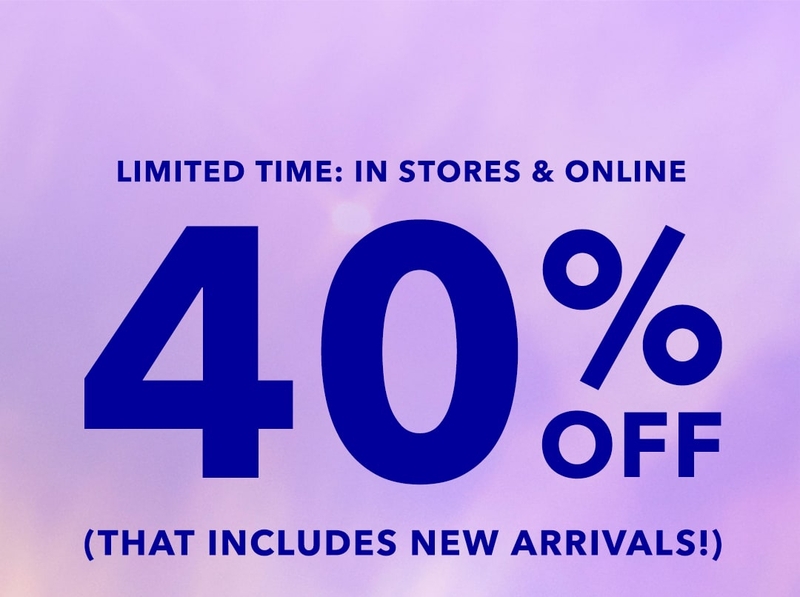 40% OFF ALL OF THE THINGS (new arrivals included!). Now through December 20, 2018 at 3:00am PST, receive automatic free shipping valid on the AE®, Aerie® and Tailgate Collections at ae.com® and aerie.com® to U.S. & Canadian addresses. Offer not valid on International orders. All prices and/or promotions at ae.com and aerie.com are reflected in USD. This offer is good for U.S. standard shipping within 3 to 7 business days pending credit approval and authorization. Tailgate offer is valid on orders shipping to U.S. addresses only. Tailgate offer not valid on Canadian or international orders. Orders to Canadian addresses will be shipped via Canada Post within 6 to 10 business days to urban areas and 15 to 22 business days to rural areas. This free shipping offer can be combined with other discount offers. Not applicable toward previously purchased merchandise. Excludes Clearance. All deliveries are pending credit approval and merchandise availability. Deliveries may be delayed due to carrier issues or weather conditions. No discount code is required at ae.com or aerie.com. Limitations apply. Click Here for details. Shipping outside of U.S. available on select 3rd party merchandise. Free shipping promotion and associated terms and conditions subject to change at AEO's sole discretion. Beginning December 12, 2018 at 6:00am EST through December 16, 2018 at 3:00am PST, receive 40% off the AE® and Aerie® Collections at ae.com® in select U.S. and Canada AE stores and aerie.com only. Prices as marked. All prices and/or promotions at ae.com and aerie.com are reflected in USD. Discount applies to merchandise costs only, prior to sales tax and shipping & handling. This discount is not redeemable for cash, nor is it applicable toward previously purchased merchandise. Valid for AEO and select Aerie branded merchandise only. Not on select Tailgate merchandise, Jeans, Aerie Undies, AEO APT, American Beagle, or on Gift Cards. Excludes 3rd party merchandise. Discount promotion and associated terms & conditions subject to change at AEO's sole discretion. NO PURCHASE OR PAYMENT NECESSARY TO ENTER OR WIN. Give Love Win Sweepstakes is open only to legal residents of the 50 United States (and DC), Puerto Rico and Canada (excluding Quebec) (the “Eligibility Area”) who are at least eighteen (18) years old at the time of entry. Sweepstakes is during store hours between: 1) December 7, 2018 - December 9, 2018; and 2) December 14, 2018 - December 16, 2018, or when supplies of Game Pieces are exhausted, whichever occurs first. 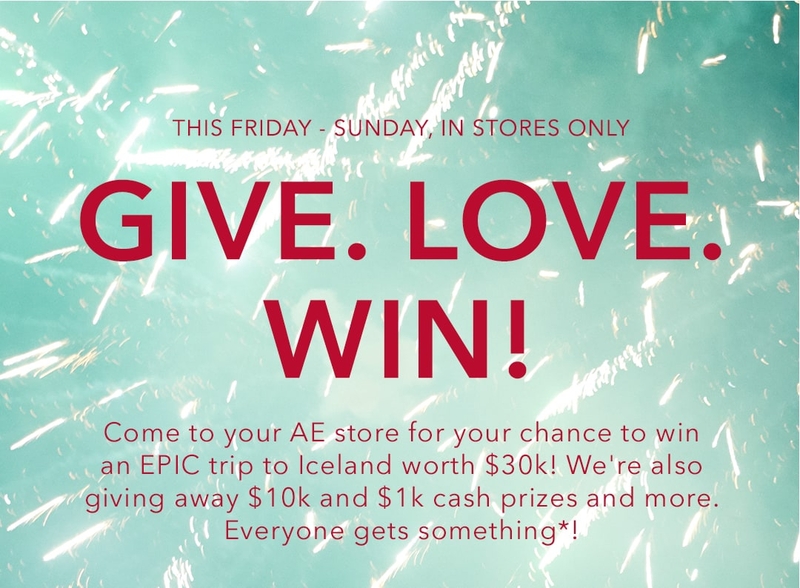 For Official Rules visit ae.com/givelovewinrules. Void outside Eligibility Area and where prohibited or restricted by law. Skill-testing question required for residents of Canada. Must submit any Winning Code by January 31, 2019. Sponsored by AEO Management Co., 77 Hot Metal Street, Pittsburgh, PA 15203. You almost missed it. Now extended! 1. DAY. ONLY. 40% off.